Create your own cozy shade with these durable Sun Shade Sails. 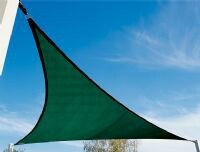 Perfect for shade that an umbrella or awning will not cover such as pools, child’s play area, or open picnic areas. Just use your imagination. Made of a UV treated polyethylene, this state-of-the-art fabric blocks the suns harmful UV rays. This breathable woven material remains unaffected by extreme temperature, moisture and allows wind and water to pass through. Heavy-duty nylon webbing runs through the outer perimeter of each sail with a heavy-duty stainless steel D-ring double stitched in at each attaching point. Sails come in two shapes; triangle or quadrilateral which is four sided. - Add a splash of color and style, while protecting yourself from the sun!